A permutation is an act of arranging the elements of a set in all possible ways. P(n, r) denotes the number of permutations of n objects taken r at a time. 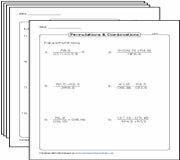 Permutation worksheets cover the topics such as listing possible permutations, finding the number of permutations using the formula, evaluating the expressions, solving equations involving permutations and more. 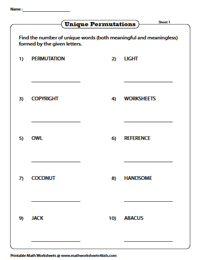 We also have exclusive combination worksheets available for download. 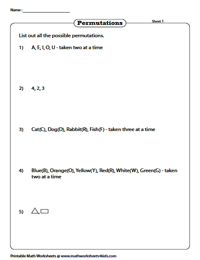 These permutation worksheets require students to write all possible ways of arranging the given objects. Use the answer key to verify your solutions. 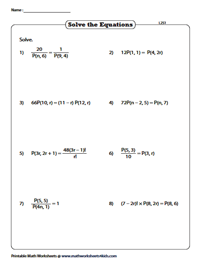 In this set of worksheets, find the number of permutations using the formula. There are five problems in each worksheet. Based on the given words, students should observe for repetition of letters and use the formula to calculate unique permutation. 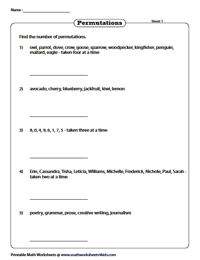 These worksheets require students to use the relevant formula to evaluate the expression involving permutation. The level 2 worksheets raises the bar by offering more complex expressions where relevant formulas need to be used for solution. Solve the equations involving permutation. Click on the "Download the set" option for all printables in this section. 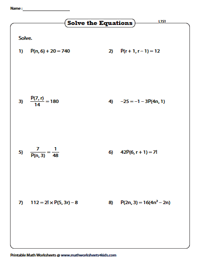 These level 2 permutation worksheets require students to solve slightly more complex equations involving permutation. 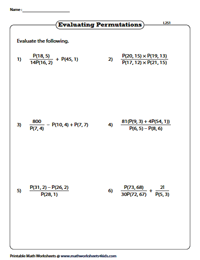 Access this set of worksheets with a blend of problems on permutations and combinations. The worksheets include identifying and write permutations or combinations, two-level of solving equations and evaluate the expressions.